We are garden fairies and we had a very busy day yesterday, but still feel that there are matters here at May Dreams Gardens that we should bring to everyone's attention so we have undertaken, once again, to post on this blog. We were very busy yesterday because the sun was shining and so we had to rush around and open up all the crocuses so that the bees and other pollinators could get to the pollen. Do you know how many crocuses there are to open up around here? Quite a few and we garden fairies had to open every single one and then when it got dark, guess what? That's right, we had to close every single one. And we'll have to do the same for every sunny day until the crocus blossoms fade, no matter how cold it is outside. And it is cold. We cannot just sit on our laurels like some gardeners we know and act like "oh, spring is so slow arriving that I have plenty of time to get the garden ready". We do not know where this laissez faire attitude comes from but it surely does not come from us garden fairies, that is for certain and guaranteed. Spring is not slow. It is here today as of 7:02 am EDT. IT IS HERE. We are garden fairies and this arrival of spring excites us very much but at the same time we are in a dither about how to get Carol -- oops, we weren't going to name names -- how to get the gardener around here to get going on spring clean up. We are garden fairies and we should make a list of what all needs to be done around here so that it gets done. We believe that what gets written down gets done. But we are not going to do that. We are far too busy. Granny Gus McGarden has already nearly exhausted herself just three days after Carol planted peas trying to make sure that those seeds don't freeze on cold nights, and out in front, Sweetpea MorningGlory is very busy tending the pansies that Carol bought and has not yet potted up. Ol' Tangle Rainbowfly says he's not going to do one thing more until Carol -- oops, we weren't going to name names -- gets out here and does her fair share. Really, we are garden fairies and we cannot do one thing more around here. We must rely on Carol -- oops, we weren't going to name names -- to wake up and realize that it is now spring and it is time to get this garden back in shape. We don't care that it is cold. Time's a wastin'! It's time all gardeners went out to their gardens and commenced getting them ready for spring which will all too soon be summer. Posted by Violet GreenPea Maydreams, the hardest working garden fairy in all of May Dreams Gardens. P.S. 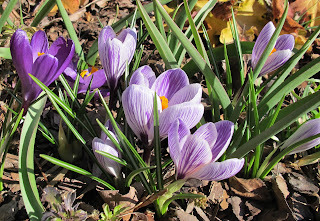 We are garden fairies and we like the crocuses with the streaks of color. We will demand that Carol get more of those. After all, what's a few more crocuses to open up around here? It's so cold, I can't motivate myself to work in my garden! I do hope Carol, oops, no name naming, the gardener at May Dreams reads this and gets to work! Time Marches on, as does Spring! Good job on those crocuses, too. I just love you Garden Fairies You are so helpful to Carol and I love it when you write a post. If you ever want to take a vacation, you are welcome to visit my garden. I bet Carol will plant more Crocus for you if you ask her nicely! Happy first day of spring to you and Carol! Well, of course, I knew that you Garden Fairies closed the crocus at night or when rain was coming, but I thought that Mr Sun caused them to pop open - my mistake! Cute post! Love the garden fairies! Awesome post! Thanks for the beautiful crocus picture and posts...thank you SPRING! You garden fairies have certainly been busy! Please be a little forgiving of Carol--oops, the gardener--though, because I can commiserate with her. It's just too darned cold here, too, to get motivated to do spring clean-up. P.S. I hope you have some warm blankets for this weekend.